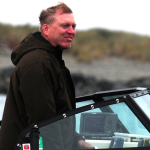 From the Helm is a new column from Larry De Ridder who covers a variety of topics related to marine fishing. November 9 from six to eight o’clock pm there was an informal presentation at the Adorni Center regarding the proposed deconstruction of four dams on the Klamath River. For those new to this, there are six dams on the Klamath River that affect fish migration. Closest to us, and furthest downstream, is Iron Gate Dam. Working upriver from there, one would encounter Copco Dams 1 and 2, and J.C. Boyle Dam. Further upriver are Keno Dam and Link River Dam, which are not being considered for demolition. Available at the Adorni Center presentation were various colorful marketing-style brochures, somewhat informative but light on details. Much of the reason for the lack of specifics is likely due to the fact this is mostly wishful thinking on the part of many parties, pending the federal government’s approval to proceed. In anticipation of an ultimate federal go-ahead, many of the involved government and private entities have created the Klamath River Renewal Corporation (KRRC), a non-profit entity created for the purpose of obtaining title to the various dams and arranging for their deconstruction. If approved, funding is projected to be split between Pacific Power, the current owner ($200 million collected from customers’ power bill surcharges) and California ($250 million from Proposition 1 Water Bond funds). Advertised benefits include: restored access to 400 miles of spawning habitat for anadromous species, reduction of toxic blue-green algae in warm lake waters, changes to job and recreational opportunities in the affected reach, and a substantial number of directly-created and support jobs for the duration of the project. Of interest to saltwater fishermen is the projected increase in salmon populations as natural spawning is enhanced, Iron Gate hatchery is closed, and the disease-infested stretch directly below the hatchery is scrubbed clean by winter floods. The three general phases of the project are (1) Planning, (2) Construction, and (3) Monitoring and Remediation. The planning phase includes everything from jumping through government procedural hoops, to collecting native plant seeds, site security, and documenting current conditions. The Construction phase is fairly self-descriptive but includes side issues such as fire control, road grading and maintenance, and arranging food and restroom facilities for the workforce. Monitoring and Remediation includes such items as native plant placement and documentation of the ecological changes as they take place. The two dams not included in the proposed demolition are expected to be transferred to the federal government. Link River Dam will continue to control the level of Upper Klamath Lake, and Keno Dam will remain in place to provide water diversion and flood control. If all goes as KRRC staff hopes, dam removal would be concluded sometime between 2020 and 2022. If salmon and steelhead move into the upper waters as projected, we could see changes to our KMZ fishing seasons only a few years later. It’s been six years since the 2011 destructive earthquake that destroyed much of the East Coast of Japan. Since that time more than 600 known pieces of debris have washed ashore on the west coast of North America. The total number of pieces is likely in the thousands. Debris first washed north and east from Japan on the Kuroshio Current, then crossed the ocean on the eastward flowing North Pacific Current, and then either came south on the California Current or swept north on the Alaska current. That debris introduced at least 300 species of animals and protists to our coast which are not native to this coast. The largest group was mollusks, which includes marine snails, nudibranchs (marine slugs, many of which are beautifully colored), and oysters. The second largest group was annelids (segmented worms), then cnidarians (including sea anemones), bryozoans (mossy-looking animals that may also resemble coral), crustaceans (crabs and shrimp), echinoderms (starfish), other smaller groupings, and two species of fish. At least two groups – sea anemones and limpets – were able to establish themselves and reproduce multiple generations on the debris they hitchhiked aboard. This is likely the single largest single migration of its sort, thanks to the prevalence of man-made materials that made the trek. In previous years most of the floating debris would have been woody material, which would rot, fall apart, or eventually sink. Most of the surviving materials in this case were plastic or other man-made materials that can survive in the marine environment for many years. It could take years to determine whether any of these Western Pacific organisms have established Eastern Pacific populations. If any of these creatures manage to establish themselves here, there could be ripple effects for many years as their influence in the existing ecosystem manifests. Despite intensive efforts to document and study arriving debris, it’s plain that most of it was never reported. If you do encounter something unusual, don’t be afraid to document where and when it was found, preserve it and contact a local Fish and Wildlife office, or a marine research institution. The document is 16 pages long and is not difficult to follow. It’s unclear at this time how long this will take to play out in the courts, nor whether there will be any trickle-down effect on sport crabbing.